The Méribel Hotel Union has taken a project out of the ordinary with the photographer Geoffrey Vabre for the production of a humorous brochure in the form of an off-line photo album. 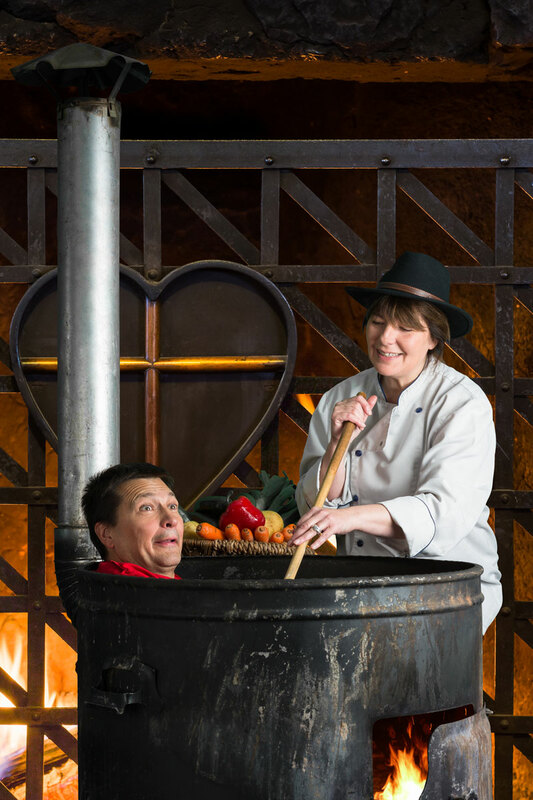 Valérie, owner of the hotel, has turned into a chef to cook Fabrice, her husband, in a giant pot. This photo, to take of course the second degree, wants to convey through the image all the warmth of Meribel hotels that are mostly family homes with a high-end home-made spirit. Indeed, we wanted to spread a refocused message on the quality and freshness of our products and recipes that are all developed with passion. Almost all the Meribel hotels have done as we do, and the owners of the establishments have all given of themselves to present the true jovial image of our beautiful resort. Our establishment the Adray Télébar, welcomes you for more than 50 years, during all the winter season in its Hotel-Restaurant at the foot of the slopes of Méribel 1650. This beautiful chalet, restored and decorated in the style Montagnard, keeps all its old-world charm thanks to the original faience, woodwork and souvenir photos that remind us of our history as ski pioneers. The rooms of the hotel are all decorated and personalized according to different atmospheres. For your stay in the mountains, we have different types of accommodation; Indeed you will have the choice between classic hotel rooms or, for those who prefer more independence, private lodges unique to meribel. Our accommodations are spacious and offer superb mountain views. All rooms have an en suite bathroom, a minibar and a flat-screen TV. It is a small hotel of quiet and eccentric charm that can decompress for a well deserved vacation. We would also like to thank La Mobylette Jaune, our digital agency that has transcribed in this film everything the spirit and atmosphere of our establishment.